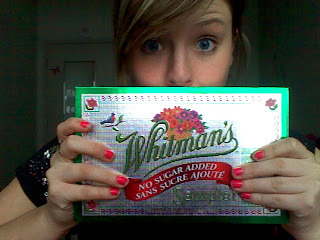 I have come to realize that my body does not like sugar-free chocolate. I never really noticed when I would have it before but now it is pretty apparent that the special chocolate isn't right for me. It could be the chemicals that are packed into the chocolate to make it better for diabetics. If I have more than one of any given candy I am bound to have a horrible stomach ache for the remainder of the day. If only there could be something that works well for diabetics? It's a shame because some of the sugar-free chocolate is really good and taste like regular chocolate and everyone is always is looking for these types of treats for me. Unfortunately from now on I am going to have to either use my will power and only eat one every now and then or not have them at all. I miss not being able to eat chocolate without worrying about my blood sugar, especially during occasions but it's something you just have to get used too. Maybe one day soon there will be a diabetic treat that is healthy and sweet.